Tuesday morning, Grand Island School District in Nebraska was told the Spanjer family that they would not be requiring Hunter, a deaf preschooler, to change the way that they sign his name. Last week, it was reported that the school district wanted his name changed because they felt it violated their ‘no tolerence’ policy because his name sign kind of, sort of, maybe just a little bit, looks like a gun. 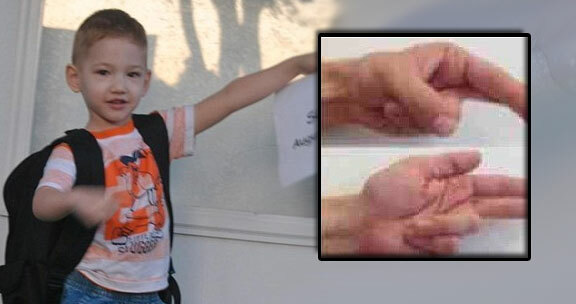 When deaf preschooler Hunter Spanjer signs his name, he does so by crossing his middle finger over his index finger on both hands and moves them up and down. His father says that this is a registered sign within S.E.E. (Signed Exact English) and he should not be made to change his name. The school board says that they feel his name is too close to the sign for a gun, which many teachers at the grand Island district feel is taking things a step too far as the signs are not similar in any way. One ASL (American Sign Language) instructor says that Hunter’s name more closely resembles the sign for ‘hurry’ than anything. Parents and community members are outraged because they don’t feel and have not yet encountered any child associating Hunter’s signed name with a gun sign. While the support for the spanjer family has been astronomical, many Portlanders are outraged that this would even be an issue, especially in a nation with a large deaf culture.